In 1907, design plans were completed and approved for the construction of the Los Angeles Aqueduct. 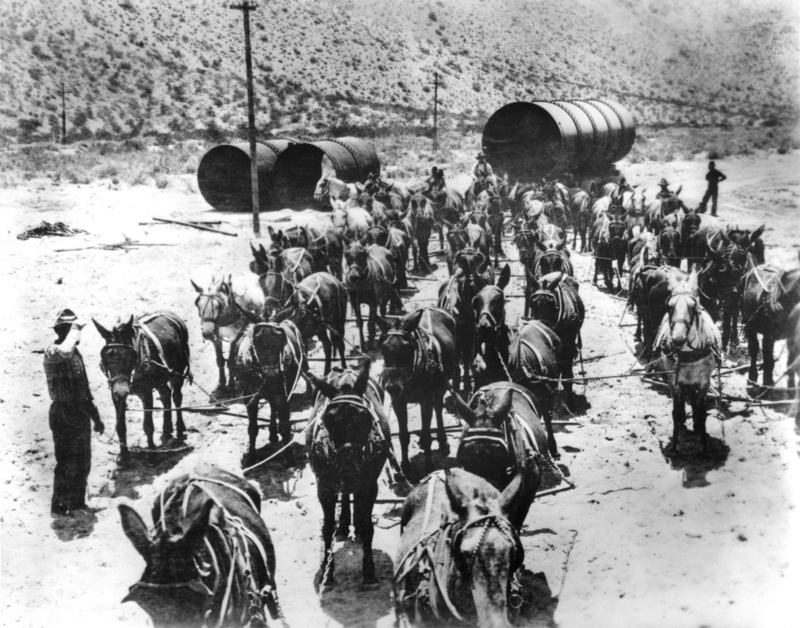 For transportation of freight and supplies to the construction camps and work sites, from the Mojave Desert to Owens Valley, the City of Los Angeles made extensive use of mule teams - most often, sixteen mules to a team. 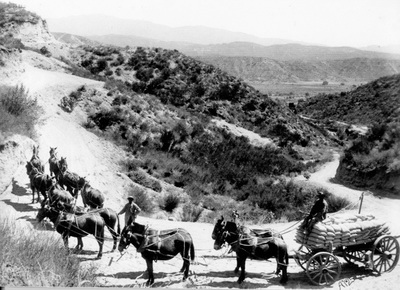 For hauling lighter loads of first aid supplies or groceries, teams of two or four mules were sufficient. The City nearly cleaned out the local market of mules, some-times buying older mules that were no longer needed in the towns due to the increasing use of motorized vehicles. When the local supply ran out, hundreds of mules were purchased in the mid-west. 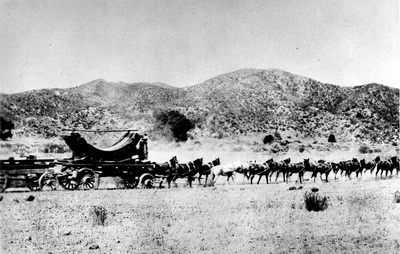 In those days mules brought premium prices, with a good mule selling for $200 and a team usually brought $400 to $500. Early on in the aqueduct construction project, Caterpillar traction trailers were used along side the mule teams. For the first few months, the noisy Caterpillars appeared to provide a saving in the costs to the City compared to the cost of road building plus the feeding and upkeep of mule teams. 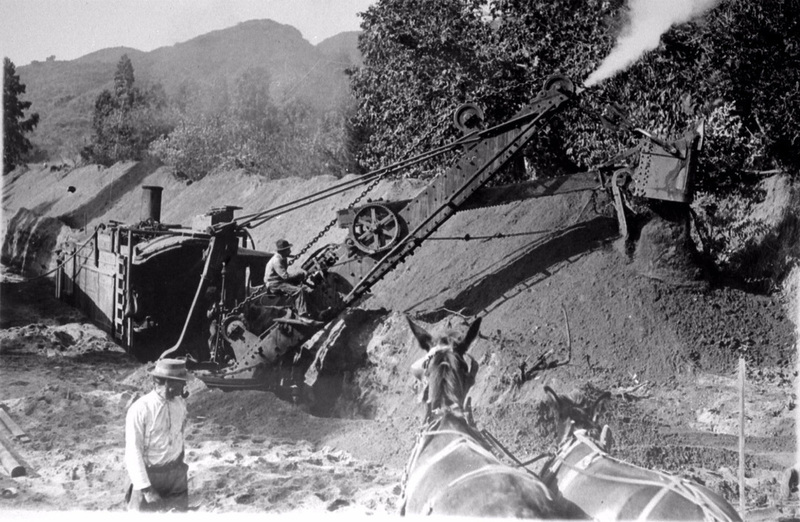 However, the harsh desert environment and rough and rocky foothills of the Sierra soon took a tremendous toll on the machines. Breakdowns were a daily occurrence and repair costs became extremely expensive. Mules, on the other hand, were strong, surefooted, and very adaptable to the severe conditions and treacherous terrain. Use of the Caterpillars was soon abandoned and the City returned to good old reliable mule power. 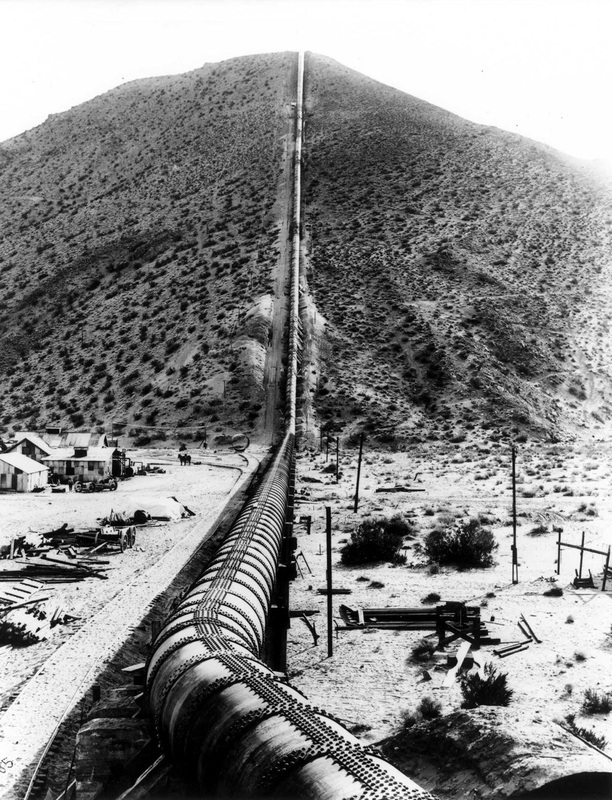 By far, the most difficult job of the entire project was the task of installing the 8095-foot steel pressure siphon at Jawbone Canyon about twenty miles north of Mojave. 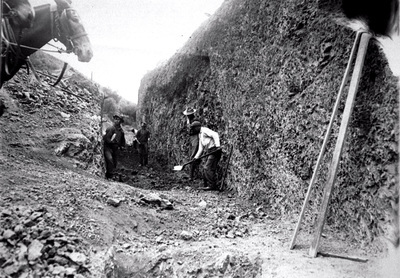 With a drop of some 880 feet to the bottom of the canyon, a tremendous pressure head was created making it necessary to use a one-inch thick steel casing in the bottom section. 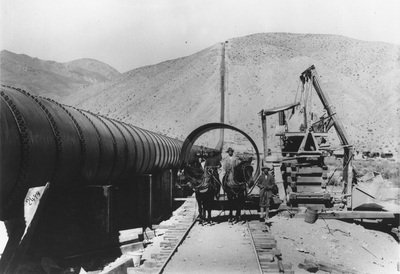 The total weight of "the most noteworthy pipe in the United States" at Jawbone Canyon was more than 3,200 tons. Once again, the strong and dependable mule was called upon to haul that heavy steel pipe over rough terrain to accomplish such a formidable task. 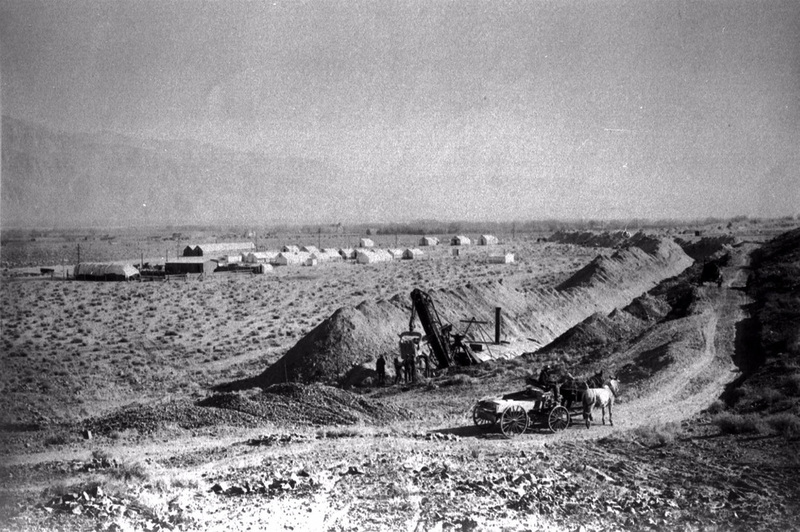 While an open ditch was constructed using electric powered dredges in Owens Valley, several miles of the rugged foothills and canyons south of Little Lake proved too difficult for digging canals or tunnels, or laying buried conduits. In those areas, great airtight pipes known as inverted siphons were installed. 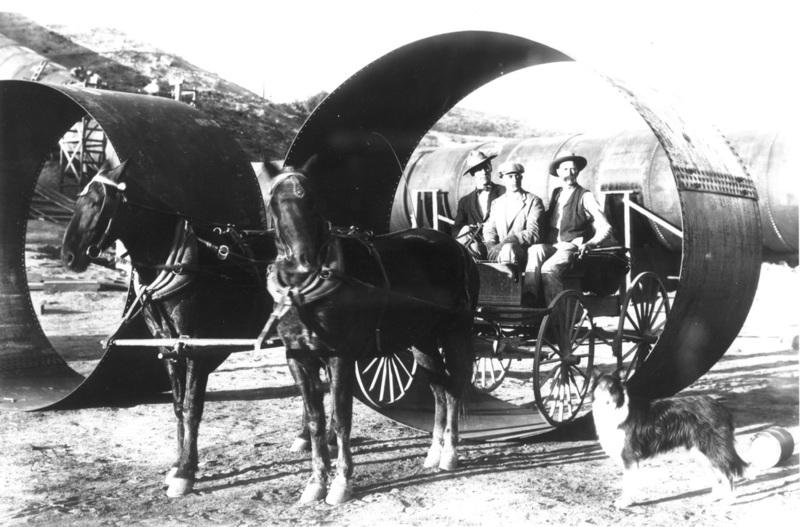 The pipes for the siphons measured from eight to ten feet in diameter - large enough to drive through! After larger mule teams had hauled sections of heavy pipe for several miles over the sandy Mojave Desert and rocky foothills to the construction sites, only two mules were needed to haul the pipe along specially designed temporary tracks.